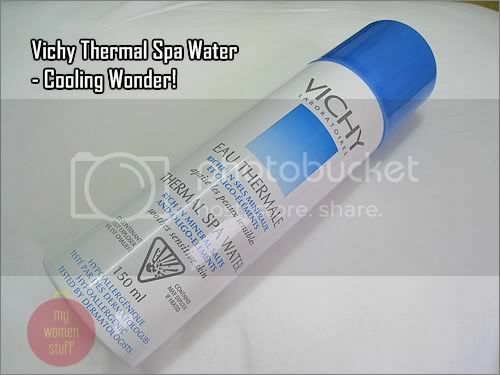 Home » Product Reviews » Vichy Thermal Spa Water Spray : Staying Cool in this heat! Hold about 10cm from your face, close your eyes and spritz the fine mist of water over your skin. Leave it on for a little while, then lay a clean piece of tissue paper over your face to blot off the water. The reason behind this method is that whilst the thermal water does help hydrate and cool your face, letting it dry and evaporate off your skin can cause your skin to dry out further. So, you are advised to blot it off after a few seconds to avoid this happening. These directions are also on the label on the can. The Vichy Thermal Spa Water is recommended for sensitive skin and thermal water has been touted as helping those with skin problems like eczema. Not having this skin condition, I can’t say for sure if it will help. What I can say is that its helping me stay cool in the heat, helping my skin stay hydrated in an air-conditioned office and helping my makeup stay on the whole day – it doesn’t get better than that! Incidentally, I’ve been using this thermal water spray in place of a toner. It works but after about 3 weeks, I found I preferred to use toner anyway because I like how my skin feels with my Kanebo Blanchir Clear Conditioner. A 150ml bottle of Vichy Thermal Spa Water retails at RM40 at Vichy counters at Guardian, Watsons, Caring and various leading pharmacies. The small 50ml bottle is RM18 and makes an excellent travel partner. Used everyday, the 150ml can has lasted me well over 1.5 months and although lighter, is not showing signs of finishing yet. Do you incorporate face mists or thermal water into your skincare regime? Which thermal water or face mist are you currently using? I’m thinking of incorporating the Vichy one into my skincare – its less expensive than I expected and my skin seems to like it. I should put it to good use more often though since the heat and weather is driving me crazy! You might be right but when I”m at home without the air conditioning on, I use the spray to stay cool. Helps calm the skin down because heat can cause dryness. I’ve just started trying Vichy products and I’m quite surprised by them. I’m currently using Avene mist spray and quite love it. It has replacing my toner as I find it redundant to use both at the same time. sometimes I just spray a lot on my skin and pat it until dry. This leave my skin hydrates and reduces the visibility of pores for temporary. I’ve bought a couple of mists but I usually use it on clients! Why am I not using them for myself??? LOL Silly me! this VIchy one sounds nice! LOL!! Time to spritz your own face! LOL I’m a mind reader I am! 😀 How are you liking your Avene? I haven’t tried it. That’s a great tip! Thanks 😀 Its not as dry here as you well know but sometimes humidity could be just as bad. I’m using Avene’s Thermal Spring Water, love it for summer. I always pat my it dry after a few secs, it leaves my skin hydrated. Yep! I was amazed that it kept my skin hydrated even after being patted off rather than left on. I quite like Vichy except that the one I bought didn’t spritz properly. Tried the Avene one and liked it too. Currently using Evian. I used to spritz throughout the day until I realized my makeup turned streaky. Now, I only spritz in the morning to set my makeup. Or when I’m feeling really really hot. I’m going to try the Avene and Evian too since so many are using those. I’m just curious if it might even feel different? I haven’t tried Vichy yet, I might do so in future! Currently I’m using both Avene and Evian as part of my eczema fighting regime and I’d have to say that Avene works better for me. Evian just feels like water, whereas Avene really does soothe the inflamed skin after multiple sprays. LOL. What I’m trying to say is that with Evian, it doesn’t feel any different (i.e. no results) from spraying my face with any normal tap/bottled water. 🙂 I don’t see lots of hydration results too, which means I have to spritz more frequently than I do with Avene. I have an 3 bottles of Avene one. Used only 1 bottle and it lasted for 6 mths already. And also a La Roche Posay one. Haven’t used yet. hheee…didn’t use too often. My makeup turns streaky when I use it to set my makeup. But not with a proper makeup fix spray. So, now I use it sometimes before my toner. I pat my face dry after spray. Then used big cotton facial pieces soaked with toner to put on my face like a mask for 15mins. The spray and the toner are different. Toners contain glycerin which helps to attract/bind moisture to the skin. As opposed to the spray which is moisture. So, to me, they are kinda different. Funny my makeup sets fine. Maybe I’m just spraying a little. I like your toner/spray technique. I’m going to try it and see if it helps my skin. I must say that regular use of the thermal spa water spray seems to have make my skin look and feel better with and without toner! I never used a facial mist =( Though I’ve been toying with the idea so thanks for the review~! I might just omit my toner and replace it with the mist. wow…i enjoyed reading your post and all your replies !!! Haha, coincidentally i’m also looking for a facial mist. Happened to come across Evian’s in Guardian, didnt know anything about it until i check it out on the internet, it seems to be quite famous. While for Avene, i saw it in the Cleo magazine. One of my friends is using it too but she didnt give much comments about it. However, many people left good comments about it in the internet, esp for those with sensitive skin. Glad to know about vichy thermal spa water from YOU ! 😀 sounds great too !!! I’m coming from South Afica, I’ve been using Vichy Products for 1 year six months now. I think I’m doing fine with the product. Hi, how do you suggest i should use this product if i were to use toner, moisturiser, sunblock and foundation in my daily routine??? Use it in place of toner, or as and when your face feels dry or warm or its a hot day.